Stina P: I didn't jinx it! I was afraid that if I posted here before my coat shows up in Threads, I would jinx it all. I think I'm on the safe side - Sarah has confirmed that my photos were good enough to use, and today I signed the photo release to The Taunton Press to use my pictures! I felt very professional signing that document. (It helps that's on a thick, structured paper as well, not the flimsy ones you're used to.) The coat is scheduled for issue #183 - can't wait! Congratulations! 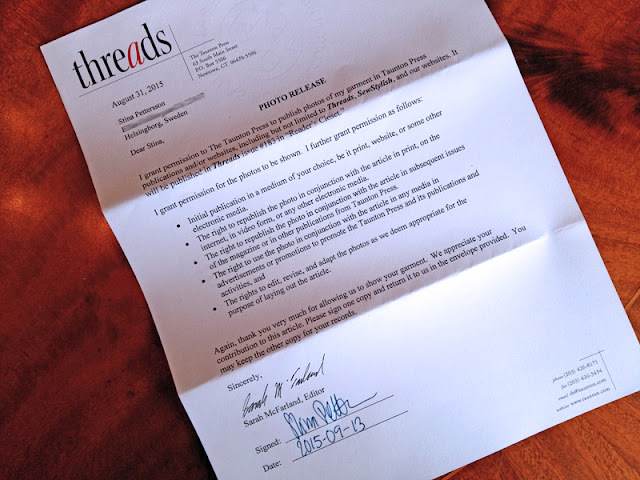 I will look for your coat in the Threads Magazine. Thanks! I'll be sure to publish it here as well. This evening I saw your red coat in Number 183 of Threads Magazine. It's beautiful and quite elegant. Anxiously awaiting your blog detailing the garment's construction. You are to be applauded on your work.